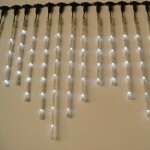 Where and how should I use icicle lights, and what in the world are LED icicle lights? What’s the difference between string lights and rope lights? What are curtain lights, and are they the same as net lights? These are probably among the questions you’re asking yourself if you’re new to the outdoor Christmas décor game. Here’s a “crash course” in outdoor Christmas lights that will make you a confident exterior Christmas lights shopper in no time flat! Icicle lights have, over the past few years, become one of the most popular categories of outdoor Christmas lights. As their name implies, icicle lights look like real icicles. Available in different shapes (traditional, snowflake, star, etc.) and colors (white, blue, pink, and purple), this variety of lights allows you to give your outdoor Christmas décor a “white Christmas” type of look–even when the weather outside is anything but frightful. Simply suspend them from the eaves and/or roofline of your home. Icicle lights come in two varieties–traditional incandescent and LED. Some proponents of incandescent icicle lights say they are a better choice because they are brighter and cost less money to purchase than their incandescent counterparts. However, fans of LED icicle lights point out that they do not contain a filament and require less energy to operate, rendering them a more economically viable option in the long run. When selecting between the two varieties, consider that LED icicle lights are made of heavy plastic, making them extremely durable. Rope and string lights are another major subcategory of outdoor Christmas lights. Manufactured from clear PVC tubing, these lights can be formed into different shapes and cut in regular increments, as well as programmed to illuminate outdoor areas in a steady fashion or using flashing/blinking effects generated by a controller. Many people like to wind rope lights around outdoor Christmas trees, and they can also be used to extend outdoor Christmas décor to railings and fences when wrapped around these structures. This variety of exterior Christmas lights allows users to place blankets of Christmas mini lights on bushes and trees, as well as to uniformly illuminate areas that may otherwise be difficult to light. A majority of Christmas net lights available on the market incorporate 150 bulbs. They’re very easy to install; just lay them over bushes or wrap them around tree trunks. Outdoor curtain lights are swaths of lights that are ideal for draping from balconies, running along gutters and draping across walls. Some vendors offer connectable LED systems wherein LED string lights, net lights and icicle lights can all be added to the same chain for an added element of flexibility to outdoor Christmas décor.